Brazil confronts a pivotal general election for president, congress, and state governors and legislatures in October. Nearly all voters deride the body politic, but few agree on who might be best suited to place Brazil on the right track. Pundits and political activists savor the uncertainty and excitement of the campaign season, but increasing numbers of Brazilian voters abhor their choices and question the legitimacy of their governing institutions. Brazilian democracy faces a reckoning of historic proportions. The politics of retribution and political tribalism are in full bloom, generously fertilized by the impeachment of former president Dilma Rousseff of the Workers Party in 2016 and the ensuing trial and conviction of former president and Workers Party leader Luiz Inácio Lula da Silva on corruption charges earlier this year. Despair and disgust frame the conversations of Brazilians as they consider who might be the best president of the country at such a difficult time. A third of voters want Lula to return to the presidency, a third claim he is a criminal and the cause of Brazil’s compounding crisis, and a third may choose to ignore the political process altogether. In the end, voters who abstain may play the determining factor in who wins and who loses. Voting is mandatory in Brazil, so those who wish to abstain can cast null ballots or simply fail to show up and try to “justify” their absence or pay a meager fine. Brazil’s participation rate is high by most standards, but the 2016 municipal elections revealed an accelerating, albeit unorganized movement to abstain. The abstention rate, including blank and null ballots, for the second round of the 2014 presidential election reached 27 percent. The rate increased to 32.5 for the second round of the 2016 mayoral elections. In recent polling, 43 percent of respondents planned to abstain or were undecided. Some will eventually cast a valid vote, but the second round of the presidential election may trigger a measurable jump in abstention. Normally abstention rates drop during the second round of the presidential election, but this year’s contest may be different. The winning candidate on October 28th may receive fewer votes than the number of Brazilians who abstain because the leading candidates suffer from very high rejection rates. These high levels of disapproval could push abstention in the second round well beyond a third of the voting age population (VAP). This possibility threatens to further erode political accountability between elected officials and the citizens. Given this possibility, candidates must decide how best to galvanize and mobilize their base supporters while encouraging undecided or unconvinced voters to sit on the sidelines rather than decide to vote for their opponents at the last minute. The spectacle of high abstention in the case of the Brazilian presidential election’s second round voting between the top two finishers of the first round will unhinge flame throwers and mud slingers, mostly from followers and through social media. Brazilian law forbids candidates and campaigns from making false statements against their opponents, but legal standards will not stop those who benefit most from the politics of abstention. Campaigns angling for higher abstention do not need high priced marketing firms, it is enough, even better to unleash their zealous followers on social media to attack opponents (just as United States President Donald Trump carried out in the 2016 U.S. presidential campaign). Yes, the tactic can backfire and heighten opposition to candidates using such blunt tools, but it can just as easily pave the way to victory. It is a strategic decision, a campaign commitment to alienate voters and depress turnout at the ballot box. Abstention can elect candidates, but it also undermines the winner’s legitimacy. Whoever wins in October could be burdened with this form of collateral damage, but most candidates are willing to deal with this outcome later. In the heat of the campaign they make decisions about how to use voters’ despair, disgust and distrust to win the election. In Brazil these factors contour the electoral landscape and could decide the outcome of the second-round voting of the presidential election because it permits candidates who cannot attract a majority of the VAP to win by plurality. While there are thirteen registered presidential candidates, seemingly a candidate for every voter, abstention may also play a role in deciding the outcome of the first round on October 7. At this point all of the principle candidates (listed below) have very high disapproval ratings that surpasses their electoral possibilities. According to Poder360, 65 percent of voters who know of Jair Bolsonaro would never vote for him. Far fewer voters know who Fernando Haddad is, but 57 percent that do would not vote for him. Alckmin, Ciro and Marina all share the same level of name recognition with rejection levels of 56, 63, and 60 percent respectively. The principle candidates share high rejection levels, but there are few signs that someone from the back of the pack, say Alvaro Dias of the Podemos party, can jumble the electoral scenario. If candidates cannot lower their rejection levels, then who stands a better chance of winning the presidency given a high rate of abstention? Each candidate faces different sets of challenges and opportunities with respect to anticipated high levels of abstention. Below are brief analyses of the principal candidates and their approach to abstention. So far, conservative-nationalist Jair Bolsonaro has made the most of this scenario because of his adroit use of social media to rivet and inspire his base of young, educated (mostly white) male voters who share his prejudice against women, Brazilians of color, and the LGBT community while adoring his rant and rave populist style. Bolsonaro’s strategy rests on dividing the population between those who praise him (and refer to him as the “Myth”) and those he tries to scapegoat for Brazil’s assortment of economic and political setbacks (such as the political establishment supporting Geraldo Alckmin and Lula’s Workers Party). He attempts to appear as an outsider, despite his nearly three decades as a federal deputy, and works constantly to “share” voters’ contempt for Brasilia. He often uses violent rhetoric to connect with his supporters, most of whom share his outlook, propensity for authoritarianism, and violent vocabulary in social media posts. Bolsonaro attracted more votes than any other candidate for federal deputy of Rio de Janeiro in 2014 because of his expertise in using social media to identify and organize a devout community of supporters. Also, he used his fame and social media reach to help elect his three sons to office. However, Bolsonaro has never run for executive office. Rather, he has only mobilized small pluralities of voters to win election in Rio de Janeiro. He now faces a much more challenging electoral calculus that forces his campaign to simultaneously increase the number of devoted followers while pushing the buttons of voter alienation and abstention. He is unlikely to convince half of the Brazilian VAP to support his mudslinging campaign, but he could squeeze through a second round with historic levels of abstention. Indeed, Bolsonaro hopes to square off with the Workers Party candidate, be it Lula or Fernando Haddad, to polarize, alienate, and move as many voters as possible to the sidelines. His path to victory depends on a 35 percent or more level of abstention. He is the candidate of abstention. The Workers Party candidate counts on strong pillars of electoral support from labor and social movements, well organized public-sector workers, small family farmers and rural workers, and the Northeast region. Haddad’s re-election campaign as mayor of the city of Sao Paulo failed miserably, but he stands a favorable chance of making it to the second round with Lula’s express endorsement. The Workers Party expanded its base support in the 2006 and 2010 presidential elections, but has since fallen on its sword with fewer electoral victories at the state and municipal levels. Haddad and his party cannot dissuade Bolsonaro voters or induce them to abstain, but they can throw mud on other candidates to depress the number of valid votes in the first round. Such an effort would be directed at Geraldo Alckmin, but might also include more nuanced attacks on Marina Silva and Ciro Gomes. Such a strategy might assure Haddad’s place in the second round, but play right into Bolsonaro’s underlying mission to depress second round voting. Rather than push abstention, Haddad’s campaign will tread lightly to lower his rejection levels in anticipation of making it to the second round. However, this strategy depends on Haddad preserving his second place approval status in opinion polling during the next month. Geraldo Alckmin is in a pickle. He enjoys the support of the Brazilian political establishment and economic elite, but inspires little confidence among voters. His long experience as governor of the state of Sao Paulo demonstrates that he is a competent public administrator who also suffers from the same evils of nearly all major politicians in Brazil, complicit associations with kickback corruption. Alckmin’s record and alliance with the legislative centrão or “big center” places him at a disadvantage in an election framed by voter despair, disgust and distrust for career politicians. He is an uninspiring, stained candidate who earned a spot in the second round of the 2006 presidential contest only to lose votes in the run-off with Lula. How can Alckmin win if most voters are disgusted with the political establishment and suspicious of economic leaders who speak of cutting back on public services and reducing workers’ employment rights? Alckmin’s path toward victory is very narrow and necessarily passes through both Bolsonaro and Haddad. Rather than alienate, he must convince the undecided that he is the solution to the country’s political polarization and instability. Alckmin is the candidate of stability, but this is unlikely to please those considering the option to abstain. Ciro Gomes failed to galvanize significant political alliances to thrust his candidacy toward the center-stage of the presidential campaign season, but he is seeking to cut through the politics of polarization and the prevalence of despair and disgust shared among most voters. Gomes hallmarked his campaign by claiming he will relieve the debts of the 63 million Brazilians listed on the SPC, the bad credit list. It is a gimmick, but it also dramatizes the candidate’s priorities of rebooting the economy by restoring credit and consumer demand among the nation’s working families. In times of sluggish growth, high unemployment, and astronomically high credit card interest rates, Ciro might be on to something. The gimmick appeals to bread and butter voters who have fallen on hard times and lost their credit. Millions of Brazilians voters share this experience and are considering abstention. This clever campaign move engages relevant voters with an instrumental decision; do you want better credit? Expect some to respond at the ballot box. This constitutes a mobilizing, anti-abstention strategy that effectively sidesteps the polarization between Bolsonaro and the Workers Party candidate, and then attempts to flip undecided, uninspired voters. Marina Silva’s third run at the presidency does not inspire. She was the surprise candidate of the 2010 election, but disappointed in the 2014 campaign by failing to make it to the second round against incumbent Dilma Rousseff. In 2018 she suffers from anemic organizational capacity and a shrinking base of support that looks like it tops at around 10 percent. She could benefit from abstention coupled with candidate fragmentation in the first round, but these same conditions might undermine her second round performance, especially given the bigger electoral support base of Bolsonaro and Haddad at this point. Her path is complex and includes getting to the second round by just squeezing by the third and fourth place candidates with some 12-13 percent of the vote, then negotiating a “big alliance” with Alckmin’s “big center” to mobilize the political establishment to endorse her in the second round campaign. At this point Marina Silva does not present a strategy to directly confront the possibility of high abstention as Ciro Gomes has done. She has the vision and the credibility to win, but lacks the vigor of a candidate willing to mobilize new sets of voters or throw enough mud at the leading candidates. Vibrant democracies capable of overcoming economic, political and social bottlenecks through majoritarian-based reforms require ample political participation and voter turnout to legitimize the mandates of those who win elections and must carry the burden of change. Brazil needs more participation and voter turnout to propel the next government to overcome the entrenched interests and reform the failed institutions of governance and public service delivery. This campaign season features dozens of political parties, some old and some new, and a full set of presidential candidates, many qualified and committed to advancing Brazil through their particular set of policy priorities. Candidates deserve attention, scrutiny, and each voter’s decision to support or reject their proposals at the ballot box. The looming spector of abstention threatens Brazilian democracy and should become a major issue for political debates and media reporting. The movement to abstain, although understandable, automatically casts indirect votes for those that win elections. Abstention undermines the legitimacy of public institutions and fuels the authoritarian inclinations of those who herd pluralities rather than cultivate majorities. 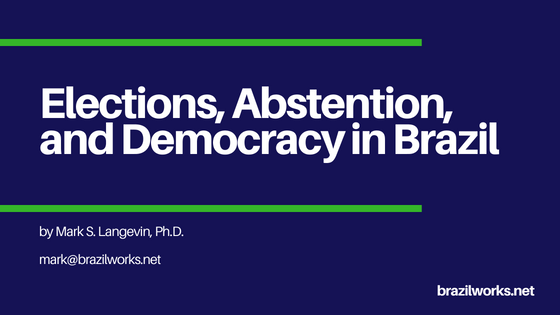 Abstention stems from the problems that plague Brazilian democracy, but it is not a solution. Abstention charges measurable costs. Vote. Brazilian President Michel Temer dodged a bullet yesterday by galvanizing a majority in the lower house of deputies of the Brazilian Congress to vote against his removal and trial by the Supreme Court for corruption. Temer’s approval ratings hover around 7 percent, and most Brazilians want him investigated for corruption; but these documented facts did not dissuade 263 deputies (from a total of 513) from absolving the president. Why did so many betray the popular will? Earmark populism is a method for obtaining the votes of congressional representatives and pacifying their constituents at home. President Temer used the promise of earmarks to trigger votes in his favor; and supply his congressional supporters with justification that can be sold to voters back home. According to the Folha de São Paulo’s report, Temer has promised more than 4 billion reais in additional spending in 2017, spread across dozens of earmarks, to obtain the necessary parliamentary support to stave off a trial in the Supreme Court. Contas Abertas also reports that Wladimir Costa, federal deputy from the state of Pará and member of the Solidariedade party, made famous by his tattoo “Temer” received a promise of $7 million reais in earmarks. Costa stated that his tattoo cost 1,200 reais and served as a memorial to Temer, “The best president in the history of Brazil.” His claim does not deserve a response. Costa’s earmarks will apparently be spent on such programs as sustainable rural development and strengthening the universal health care program SUS in the state of Pará. These seem to be worthwhile public initiatives, but the use of government funds to secure a vote to avoid prosecution for corruption is ironic and disappointing for those committed to fighting corruption in Brazil. Moreover, most of Temer’s supporters in the lower house of congress voted in favor of the impeachment of former President Dilma Rousseff last year for her fiscal management, her use of the so-called “pedaladas.” Many of these same deputies were willing to accept or coordinate earmarks just as the government appears to be failing to meet its fiscal deficit targets (spending more than forecasted to deepen the deficit). Remember, many notable economists supported Dilma’s impeachment due to what they argued was fiscal mismanagement. Today, these economists are either silent or stand betrayed by the consequence of their own political action. The well-respected economist Monica de Bolle defended her support for Dilma’s impeachment in the pages of Terraço Econômico, in part by claiming that the former president was responsible for fiscal mismanagement related to the pedaladas. It is important to remember that the so called pedaladas were budgetary operations that simply delayed transfers from the Federal Treasury to the Banco do Brasil e Caixa Economica for public programs, including small farmer financial support and the Bolsa Familia social welfare programs. Bolle and others, including Mansueto Almeida, claimed these budgetary actions were irresponsible at best and possibly constituted the “crime of responsibility” that served as the justification for impeachment. Then came Temer. Today, Mansueto Almeida remains in his position with Temer’s government, but silenced by the President’s earmark populism to avoid prosecution. Monica de Bolle is a strident critic of Temer, and recently noted that he needs to leave or risk “institutional corrosion” that might place Brazil on the path to become another Venezuela. Ameida, last May, argued that the government must carry out a fiscal adjustment and push forward a reform agenda that can initiate economic recovery, and that two years under Temer is sufficient to place Brazil back on the road to growth and fiscal stability. Monica and Mansueto are entitled to their critique of former President Dilma and her fiscal affairs. They both spent 2015 and 2016 trying to explain the details of the pedaladas and how they may have jeopardized fiscal stability and economic development. However, Temer’s earmark populism and Attorney General Rodrigo Janot’s charge of corruption against the president pose a more straightforward challenge to explain. No doubt Monica and many others will bear down on the damage done by failing to achieve the fiscal targets set for 2017, and others including myself, will point to the now obvious connection between earmark populism and congressional efforts to protect the guilty from prosecution. Mansueto continues to work for Temer’s Finance Ministry, but for how long? How long will it take for Mansueto and his boss, Finance Minister Henrique Meirelles, to understand that the government they work for is now actively working against fiscal stability, economic recovery, and the Lava Jato prosecutions? I hope it does not take too long because Brazilian democracy hangs in the balance.